We’re great value for money and membership for adults is just £10 per year (January to December). We also welcome junior members (under 18) for free. If you’re joining us after Oct 1st we offer membership right through to Dec 31st the following year, for the same low price. We’re also happy to welcome members of of other clubs who wish to join the club on a second claim basis, for which the membership fee is £5.00 per year. To join the club now please download and complete the form below which includes details on where to send your application. The Disability Discrimination Act 1995 defines a disabled person as anyone with, "a physical or mental impairment, which has a substantial and long term adverse effect on his or her ability to carry out normal day-to-day activities"
Please detail below any important medical information that our club should be aware of (e.g. epilepsy, asthma, diabetes, a recent injury, etc.) Medical condition/s and recommended treatment/actions to be taken if symptoms appear: if you have any concerns about yourself / child participating in any form of physical activity then please consult your GP before consenting for yourself / child taking pat in cycling activity sessions. Do you have any first aid qualifications? 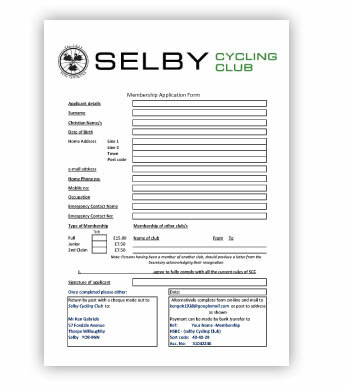 It is necessary to obtain consent for your child to take part in Selby Cycling Club activities. If you wish your son/daughter to participate then please read and complete the separate document ‘SCC Form of Authority’ which will be sent out when their application has been received and sign the Parental Consent Notice. Any information provided about your child will be kept confidential and secure. Any questions can be directed towards the SCC Child Welfare Officer, Nicola Lines via info@selbycyclingclub.